We’d love your help. Let us know what’s wrong with this preview of Cats' Eyes by Mollie Hunt. What if a retired cat-lady discovered a stolen sixty-eight carat chunk of trouble in her back yard pond? Lynley Cannon is the crazy cat lady, but she's not quite crazy yet, though a bizarre connection to a bumbled heist and a double homicide has got her wondering in this 1st Crazy Cat Lady cozy mystery. Retiree Lynley Cannon adores her Old Portland home with her clowder of r What if a retired cat-lady discovered a stolen sixty-eight carat chunk of trouble in her back yard pond? To ask other readers questions about Cats' Eyes, please sign up. Cats’ Eyes is a cat-lovers’ mystery about a cat-loving fifty-something-year-old woman who doesn’t just love her own pets; she helps out at the shelter; she fosters cats in need; and she gets uncommonly tangled in danger and mystery, rather like a cat getting tangled in wool. Chapters are headed with cool cat motifs and intriguing tidbits of information about cats, making the pages of this novel a delight to savor. The protagonist, not quite a crazy cat-lady, is convincingly human, enjoying the b Cats’ Eyes is a cat-lovers’ mystery about a cat-loving fifty-something-year-old woman who doesn’t just love her own pets; she helps out at the shelter; she fosters cats in need; and she gets uncommonly tangled in danger and mystery, rather like a cat getting tangled in wool. Chapters are headed with cool cat motifs and intriguing tidbits of information about cats, making the pages of this novel a delight to savor. The protagonist, not quite a crazy cat-lady, is convincingly human, enjoying the benefits and pitfalls of an aging body, and quoting the Bene Gesserit litany against fear as well as the Serenity prayer when in trouble--fun if, like me, you fell in love with Dune a long time ago. And it’s a fast, good read. The story’s told in first person, and the protagonist’s voice is natural and easy to hear in the head. A fun read, following the misadventures of a cat shelter volunteer who finds herself in the middle of a series of escalating crimes. Lots of unexpected twists and turns, with interesting cat facts thrown into every chapter. When one of Lynley's five cats brings a rock into the house, she thinks nothing of it, but that's the start of a summer of mystery and danger. With the help of her friends at the Friends of Felines animal shelter, she has to get to the bottom of both a jewel theft and a murder or be the next victim. I enjoyed the mystery and the cat tidbits at the beginning of each chapter. After just losing my cat, Sammy, I wasn't sure that reading a book regarding cats in any form would be good. BOY was I wrong !!!! 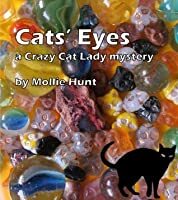 Being a "crazy" cat lover myself and having rescued 2 wonderful cats there was so much I could understand and relate to in Cats' Eyes by Mollie Hunt. If you are a cat lover or even an animal lover and pet owner I HIGHLY recommend grabbing this book. It is the first in Hunt's Crazy Cat Lady Mystery series and I cannot wait to get my paws on book two, Copy Cats. Lynley C After just losing my cat, Sammy, I wasn't sure that reading a book regarding cats in any form would be good. BOY was I wrong !!!! Being a "crazy" cat lover myself and having rescued 2 wonderful cats there was so much I could understand and relate to in Cats' Eyes by Mollie Hunt. If you are a cat lover or even an animal lover and pet owner I HIGHLY recommend grabbing this book. It is the first in Hunt's Crazy Cat Lady Mystery series and I cannot wait to get my paws on book two, Copy Cats. Lynley Cannon is the definition of "crazy" cat lady. She has a handful of cats of her own, she volunteers at a cat-only shelter with her best friend Fannie and she foster's cats. Although she a huge cat lover and lives in a big house alone with her cats she is far from crazy. Lynley finds her world turned upside down and she doesn't even know why. Apparently there are 2 stone-looking diamonds that are brown and resemble a cat's eye and 2 brothers think that she has them. She actually had one that her cat Fluffs brought in from the backyard. Her home was broken into but Lynley had no idea why. She didn't even realize the ONLY thing taken was the rock/diamond. Lynley gets attacked, kidnapped, drugged, left to die on a mountain and then held captive in her own home and throughout these ordeals the only thing she is worried about is her CATS. I've never read the author before, but I'm sure glad I found this book. 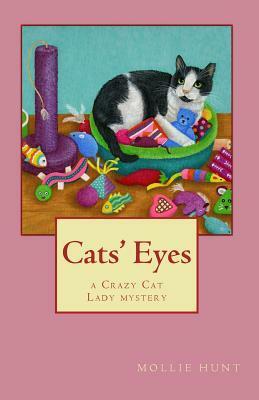 I love cats (and dogs) and the book revolved around cats and a great mystery. I really like that the author put information and tips about cats at the beginning of each chapter. The only thing that I didn't care for- The main character, 58 year old Lynley, calls her mother by her first name, Carol, and not mom. Lynley's granddaughter calls her Lynley, instead of grandma. It's no big deal, it just bugged me. Very good and fun!! What a fun ride of a read! This book has very well-developed characters, both likeable and unlikeable, an adorable cast of cats (each with their own distinctive personalities). I love that the protagonist works at an animal shelter, what a great thing to do! This book went fast and quick for me (even though I was in a hospital stay). I enjoyed it so much I'm starting number 2 in the series. Lynley Cannon is the crazy cat lady, much of the fifty-eight-year-old retiree’s life is focused on cata.